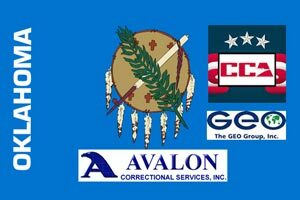 A former director of the Oklahoma Department of Corrections says private prisons in Oklahoma are scheming to keep people behind bars so they can increase corporate profits. The lifelong corrections employee unloaded on the private prison industry in the most improbable of places. Here’s how the scheme works: Private prisons create demand for their services much like drug dealers ensure that their customers are addicted, but not so addicted that they die. These companies inject their lobbying dollars and campaign contributions into the political world, contributing to a climate in which no one can be reelected by appearing soft on crime. The result is a machine that passes laws to ensure more and more people flow into prisons, regardless of whether society actually is made better by having these people behind bars. Jones resigned his post as Oklahoma’s top corrections official Oct. 1, 2013, amid fiscal conflicts with Gov. Mary Fallin and legislators. He had worked for the agency since 1977, starting as a probation and parole officer. In news reports at the time of his resignation, Jones questioned the ethics and morality of private prisons in Oklahoma. His Christian background inspired his moral objection to incarcerating people for profit, Jones told The Oklahoman. Contractual promises to provide private prisons a steady influx of inmates make matters even worse. Lock-up quotas that assure corporate prisons a minimum number of inmates – or payments for not housing inmates – stand in the way of a fair criminal justice system, Jones said. While their lobbying generates a booming voice in public policy debates, private prisons often have little to say to the public about how they manage their public contracts. Private prisons disclose less information to taxpayers than public corrections agencies typically disclose, concluded a Feb. 18, 2014 report by Citizens for Responsibility and Ethics in Washington. While a few states – and corporate investors – have backed away from private prisons, Oklahoma is riding a nationwide tide of increased reliance on private lockups. On top of that, Oklahoma is simply out of step with a nationwide trend toward reduced incarceration rates. The federal Bureau of Justice Statistics reported that the number of inmates housed in private prisons nationwide jumped by nearly 5 percent between 2011 and 2012 – the most recent year for which BJS provides data. Since 2000, the average annual increase in privately housed prisons had been less than 2 percent. Oklahoma Watch reported in Jan. 2014 that Oklahoma corrections officials were considering moving even more inmates into private prisons. At that time, nearly one of every four Oklahoma inmates was held in a private prison. Using BJS data, 247wallst.com reports Oklahoma incarcerates a greater percentage of its population than all but three other states. While incarceration rates dropped nearly 2 percent nationwide between 2011 and 2012, Oklahoma’s incarceration continued to climb. Oklahoma imprisons more women, per capita, than any other state. As state officials crowd more inmates into prisons, and reduce oversight by contracting with for-profit corporations, inmates and corrections employees alike face increased risks. Oklahoma courts recently reversed state laws that had previously shielded corrections agencies from lawsuits. If you or someone you know is injured in a prison due to neglect, contact an Oklahoma attorney at Wirth Law Office to find out if you may be entitled to compensation. The best way to reduce prison populations overall may be to adopt policies that prevent crime, divert non-violent offenders and eliminate financial incentives for policymakers to cater to for-profit prison companies. When you are facing possible prison sentence, however, the best way to avoid incarceration is to show up in court with skilled, qualified legal criminal attorney. For a free consultation with a Tulsa criminal defense attorney, contact Wirth Law Office at (918) 879-1681. You may also send your questions using the form at the top of this page.